So-called sin taxes, even those passed with the best of intentions, have undesirable consequences because they contradict basic principles of economics, finance and, most importantly, free choice. Sin taxes in modern economic terms amount to excise, or per unit, taxes that are chiefly designed to reduce specific behaviors thought to be harmful to society.1 Sin taxes have played roles of varying importance throughout U.S. tax history. The ever-expanding list of taxable "sins" proposed by governments includes cigarettes, alcoholic beverages, gasoline, bullets, and, more recently, sugary soft drinks and fatty snacks. State and local governments are increasingly imposing sin taxes as political activists try to force Americans to adopt their own version of "clean living. "4 These taxes are designed to raise prices so that "sinful" goods become so expensive that consumers will give them up for something healthier. However, this rarely happens. The federal government has also attempted to impose "hefty" taxes on sugared sodas and sports drinks to reduce obesity in the United States.6 The assumption is that this sin tax would reduce caloric intake because consumers would stop drinking high-calorie drinks and/or switch to lower-calorie drinks. 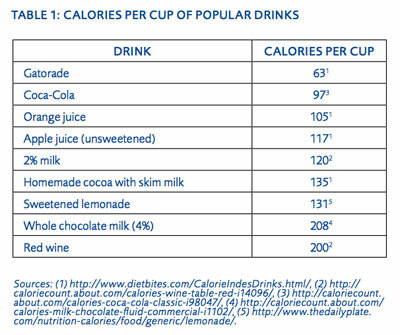 However, as table 1 shows, if consumers respond to the proposed sin tax on sodas and sports drinks by switching to some of the potential substitute drinks, their caloric intake would either remain the same or actually increase. Although the underlying rationale for sin taxes is to discourage consumption of "sinful" products, it is often argued that the tax would also help raise revenue that would, in turn, be used to finance projects like federal health insurance. The problem with this argument is that these regulatory and revenue-raising justifications work at cross-purposes. If the tax is actually effective at discouraging consumption of a "sinful" good, after all, then there would be very little revenue raised because people would purchase much less of the more expensive good in question. To help solve the obesity problem, some localities have already begun to impose "hefty" taxes on sugared sodas and sports drinks to reduce obesity in the United States.7 This appears to be most true for cigarette taxes as many continue to purchase cigarettes at the higher taxed prices.8 Recent anti-smoking initiatives at the federal, state, and local levels have gained unprecedented popular support, probably because of their ability to raise revenue. For instance, President Obama recently signed a law that increased federal tobacco excise taxes on a pack of cigarettes from $0.39 per pack to $1.01.9 However, as we shall see, the revenue raised is hardly ever used for its proposed purpose. Generally speaking, people support taxes that benefit them directly; that is, they lobby for taxes to receive "rents." In many cases, two dissimilar groups may support taxes for completely different reasons and be wooed by revenue-hungry politicians. Bruce Yandle calls this phenomenon "Bootleggers and Baptists," an expression derived from an unlikely alliance that formed during Prohibition.11 Bootleggers, or those who smuggled alcohol illegally, gain business at the expense of their legal competitors, while Baptists, who sought to reduce alcohol consumption, see their moral goals legislated. For the result to be durable, both parts of the coalition must remain in place. For instance, the cooperation of "Baptist" government officials and ethanol producers have kept ethanol subsidies in place. Nonprofits fighting for a particular cause also have to fear competition from the government. Often, they end up having to fight against politicians who are first and foremost interested in increasing government funding. For instance, a coalition of California nonprofit antismoking organizations, directed by the umbrella group Americans for Nonsmokers' Rights, brazenly sued Governor Pete Wilson for "illegally diverting" more than $165 million that supposedly should have been spent on "education" programs and instead was "improperly used for health screening and immunization of poor children.14 In fact, there is never any guarantee that tax funds will be used as advertised, and there is very little public control. These funds usually go into the general fund or toward other politically favored causes. If the objective of sin taxation is to alter "objectionable" behavior, less-costly options exist in the private sector. For example, a coalition of scientists, academics, health organizations, food producers, and retailers developed the Smart Choices Program to better inform consumers about the nutritional characteristics of food.19 Through its front-of-pack labeling program, Smart Choices identifies healthier food and beverage choices within specified product categories. Unlike coercive government measures to tax unhealthy foods and beverages, this program provides the information people need to stay within their recommended caloric intake and make product-by-product nutritional comparisons at their discretion. Another example is given by the Phoenix Companies Inc. insurance company, which has started offering discounts to customers who maintain a low Body Mass Index (BMI).20 Their program offers discounts up to 20 percent on life insurance policies to customers whose BMI is verified by a doctor to be between 19 to 25.21 In fact, most insurance companies already provide a discount for customers who do not smoke or drink.22 Private market programs and products like these that encourage and reward healthy lifestyles instead of punishing personal choices are more efficient solutions to curbing obesity than sin taxes on unhealthy products. So-called sin taxes, even those passed with the best of intentions, have undesirable consequences because they contradict basic principles of economics, finance and, most importantly, free choice. In general, since proposals to tax lifestyle choices are concentrated on narrow consumer choices, they are rarely efficient. What's more, taxing sin usually does not end up significantly altering the "sinful" behavior but rather rewards the very private organizations or politicians who have lobbied for the tax. Also, sin tax revenue is collected primarily at the expense of the poor and crowds out private expenditures on health care. 1. Adam Gifford, Jr., " Whiskey, Margarine, and Newspapers: A Tale of Three Taxes," in William F. Shughart II, ed., Taxing Choice: The Predatory Politics of Fiscal Discrimination (New Brunswick, NJ: Transaction Publishers, Rutgers—The State University of New Jersey, 1998), 57–77. 2. Gary M. Anderson, "Bureaucratic Incentives and the Transition from Taxes to Prohibition," in William F. Shughart II, ed., Taxing Choice, 139– 161. There were, of course, numerous inconsistencies in Smith's discussion of the revenue maximization objectives of government, despite the extensive application of his ideas to promote the revenue-generating power of taxes on "sin" even today. See Kelly D. Brownell and Thomas R. Frieden, "Ounces of Prevention—The Public Policy Case for Taxes on Sugared Beverages," http://www.yaleruddcenter.org/resources/upload/docs/what/industry/SodaTaxNEJMApr09.pdf/. 3. Breanda Yelvington, "Excise Taxes in Historical Perspective," in William F. Shughart II, ed., Taxing Choice, 31–56. 4. Thomas J. DiLorenzo, "Taxing Choice to Fund Politically Correct Propaganda," in William F. Shughart II, ed., Taxing Choice, 117–138. 5. William N. Evans and Matthew C. Farrelly, "The compensating behavior of smokers: taxes, tar and nicotine," The RAND Journal of Economics 29, no. 3 (Autumn 1998): 578–595, http://www.jstor.org.mutex.gmu.edu/stable/pdfplus/2556105.pdf/. 6. Anemona Hartocollis, "New York Health Official Calls for Tax on Drinks with Sugar," The New York Times, April 8, 2009, http://www.nytimes.com/2009/04/09/health/09soda.html/. 7. William F. Shughart II, "The Economics of the Nanny State," in William F. Shughart II, ed., Taxing Choice, 13–29. 8. Evans and Farrelly, "The compensating behavior of smokers: taxes, tar and nicotine." 9. National Conference of State Legislatures, "2009 Proposed State Tobacco Tax Increase Legislation," http://www.ncsl.org/programs/health/Tobacco_Tax_bill09.htm/ (updated May 21, 2009). 10. Harold Hotelling, "The General Welfare in Relation to Problems of Taxation and Railway and Utility Rates," Econometrica 6 (July 1938), 242–69, in Paula A. Gant and Robert B. Ekelund, Jr., "Excise Taxes, Social Costs, and the Consumption of Wine," in William F. Shughart II, ed., Taxing Choice, 247–269. 11. Bruce Yandle, "Bootleggers and Baptists in Retrospect," Regulation 22, no. 3 (1999). 12. The coalition consisted of the American Cancer Society (ACS), American Lung Association (ALA), American Heart Association (AHA), and California Medical Association (CMA). 13. Thomas J. DiLorenzo, "Taxing Choice to Fund Politically Correct Propaganda," in William F. Shughart II, ed., Taxing Choice, 117–138. 14. Yelvington, "Excise Taxes in Historical Perspective," 31–56. 16. Daniel B. Suits, "Measurement of Tax Progressivity," American Economics Review 67, September 1977: 742–52, in Gant and Ekelund, "Excise Taxes, Social Costs, and the Consumption of Wine," in William F. Shughart II, ed., Taxing Choice, 247–269. 17. Randall Lutter, et al., "The Cost-Per-Life-Saved Cutoff for Safety-Enhancing Regulations," Economic Inquiry 37 (1999): 599. 18. Jackie Teague, Don Anderson, and Fred Kuchler, "Health Transfers: An Application of Health-Health Analysis to Assess Food Safety Regulations," Risk, 1999. 19. Smart Choices Program, "About the Coalition," http://www.smartchoicesprogram.com/about.html/. 20. MSNBC, "Shrink your BMI—and your insurance bill: Insurers offers discounts on policies for slender customers," http://www.msnbc.msn. com/id/17385151/. 21. BMI is a measure of body fat that based on an individual's height and weight. The Centers for Disease Control and Prevention defines obesity as a BMI of 30 or more; people between 25 and 30 are considered overweight. See Office of the Surgeon General, The Surgeon General's Call to Action to Prevent and Decrease Overweight and Obesity 2001 (Rockville, MD: U.S. Department of Health and Human Services, 2001), http://www.surgeongeneral.gov/topics/obesity/calltoaction/CalltoAction.pdf/. 22. Larry Hand, "Employer Health Incentives: Employee wellness programs prod workers to adopt healthy lifestyles," Harvard Public Health Review, Winter 2009, http://www.hsph.harvard.edu/news/hphr/winter-2009/ winter09healthincentives.html/. 23. William F. Shughart II, "Introduction and Overview," in William F. Shughart II, ed., Taxing Choice, 1–9. 24. Thomas J. DiLorenzo, "Taxing Choice to Fund Politically Correct Propaganda," in William F. Shughart II, ed., Taxing Choice, 117–138. 25. James M. Buchanan, "Politics and Meddlesome Preferences," in Clearing the Air: Perspectives on Tobacco Smoke, Robert Tollison, ed. (Lexington, Mass: D.C. Health, 1988) in Thomas J. DiLorenzo, "Taxing Choice to Fund Politically Correct Propaganda," in William F. Shughart II, ed., Taxing Choice, 117–138.